Before we left Copenhagen we had no idea about the safety in Morocco. Going to a Muslim country at times is portrayed in the media as a death sentence. Well, we can happily tell you that your safety in Morocco will be fine! But, your sanity, that’s a completely different story. After 2 months in the country, we picked up a few tricks and tips so you can stay safe and sane while visiting this beautiful country. As soon as we arrived in Morocco, we were hit in the face with our first scam. Walking to the bus, we were offered a cab for the same price and couldn’t see the harm. Shame on us. Much to our frustration, once we started moving the price magically increased by 40 dirhams. Immediately our negotiating skills came into play, but all our cab driver would say with an arrogant shrug was “welcome to Morocco”. This was a rude awakening to both Mariana and I who both see ourselves as well versed in travel scams. However, it was a theme we saw and dealt with over and over again during our time in Morocco. There are a few more variations of these, but essentially they are all the same; a big fat lie to get you to open your wallet. Most will be working on commission, which is passed back onto you. So really not that nice guys after all. These women can be very blunt and rude in trying to get that henna ink on you. Most will physically grab your arm. If you willingly get it done, the design might be bigger and more intricate than what you thought, forcing more cash out of you. Leather shop owners will tell you very nicely that you can use their balconies for “free” to look into the work areas. 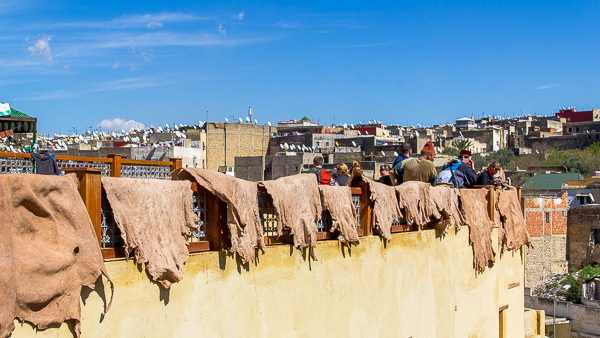 They will then tell you everything about the tanneries and show you all the goods they are selling as well. If you reject the goods, they will say you have to pay them for the “tour” they gave on the balcony. If you then say no to that, you will be abruptly thrown out of the “free’ balcony and shop. It starts with you trying to walk past their shop and the owner standing in your way. You’ll then be persuaded with something like “come and have a quick look at my shop. Don’t ignore me, just a quick look. Looking is free”. You’ll have no intentions of buying anything, but as soon as you step in, they will take it as a certainty in their mind that you will. Once you’re inside, they will offer you a tea as it’s a “Berber tradition”. It’s not. Several locals told us that it’s fine to turn the tea down and they shouldn’t be offended. They will act like it, though, as they are just trying to keep you around for long enough to tell you about everything in the shop. Tips How YOU can survive all of these scams! 1. Ignore EVERYONE and use your “Moroccan tunnel vision”, as we liked to call it, or, if that doesn’t work, tell them very frankly “no thank you”. If that doesn’t work, try some of your new Arabic such as “barakah” (enough) or “inshallah” (if Allah wants). 2. Download a map of where you are before leaving your hostel. We use the Google maps app, which is fantastic for offline GPS usage. Looking at your phone also has the added bonus of not looking as lost as a traditional map can. 3. Take everyone who comes up to help you in touristy areas with a grain of salt. In these areas, 9 out of 10 times they are trying to get your money and aren’t actually being helpful. It sounds harsh and they will counter with a guilt trip comment or call you names, but it is the only way you’ll stay sane. If you listen to every “helpful” person, you won’t do anything else with your day and your wallet will be a lot lighter. Taking an unofficial guide may be enticing for a cheap alternative, but there have been incidents of violence when tourists have used these people. 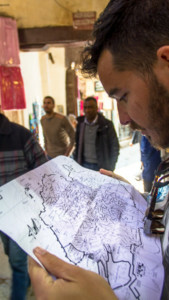 The government is taking action to combat this with undercover police questioning any Moroccan showing foreigners around to ensure that they are in fact official guides. If not, the Moroccan with you might end up spending a few nights in jail. As our friend Said from Tagounite told us, this has happened to him. He was working at a riad in Marrakesh when some guests asked if he could show them to an ATM. On the way there, the undercover police stopped him and the guests and proceeded to taking Said to jail. Luckily, he was able to reach his boss and was released the following day. Still – one night in detention for showing some guests where an ATM is. 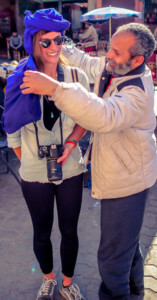 As a woman in Morocco, walking in the streets can bring lots of unwanted attention to you. Mariana was inappropriately touched in the crowded Jamma el Fna and all the girls we met said that staring in general was an everyday issue, even if they were with a guy. Also, female travellers should consider dressing conservatively (covering knees and shoulders). While I was walking around in my shorts and t-shirt every day, Mariana had to wear pants and a long-sleeve shirt. The days Mariana didn’t, she felt naked and it did draw a lot more stares. Moroccans in the rural areas take this very seriously, even when we were inside their homes they would cover head to toe. 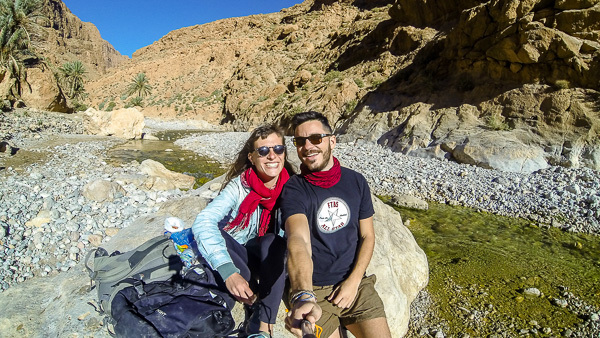 In any case, we both think solo female travellers in Morocco might be better off teaming up with a travel buddy. If that wasn’t really your plan, just make sure to pack some extra thick skin in your backpack – you will need it. This one should be fairly obvious, but don’t walk around late at night in the medinas. There are stories of people watching and following tourists, waiting for them to get off the main track and a little lost before stealing their stuff. Having put all this doom and gloom in your mind, it also has to be said that Morocco is a beautiful country with huge potential for tourism. When you get out of the touristy areas and go to places like Imessouane, these problems are far less in your face and even nonexistent. In the end, the issues here are no different to many other countries we’ve visited, but they just seemed more mentally draining here.